Well known for its strength, steel is the most common metal alloy in the world, produced in one form or another since 1400 BC. In its simplest form, steel consists primarily of iron and contains varying amounts of carbon. Carbon is the most cost-effective way to alloy iron, solidifying the structures in it and strengthening the resulting metal. Steel is one of the most frequent material choices for projects where weight and corrosion are not a concern and strength is required. Steel remains a popular choice today due to its relatively low cost, availability, and strength. Winzeler Stamping Company has extensive steel metal stamping experience with components being manufactured for the automotive, heavy truck/class eight, and lawn & garden industries. Altering the amount of carbon contained with the iron in the alloy changes the properties of the steel. Generally carbon composition ranges between 0.2% and 2.14%. Steel is typically considered to be carbon steel when only trace amounts of other elements such as manganese, copper, or silicon are contained within the composition of the metal. Increasing the carbon content makes the steel harder and stronger, but reduces the weldability and ductility, and makes the steel more brittle. Steels with very low amounts of carbon, 0.05% to 0.3% are called considered low-carbon steels and are very similar to iron. They are very ductile, which makes them difficult to machine. High-strength low alloy (HSLA) steel is a type of alloy steel which provides better mechanical properties and/or greater resistance to corrosion than carbon steel. Typically, HSLA steels have low-carbon content, between 0.05%-0.25%, to retain formability and weldabilty. 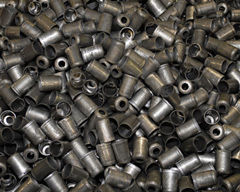 The steel is improved and strengthened with other alloying elements including up to 2.0% manganese and small quantities of, copper, nickel, niobium, nitrogen, phosphorus, silicone, vanadium, chromium, molybdenum, calcium, zirconium and titanium. Because HSLA alloys are stronger, they can be used in thinner sections, making them particularly useful for automotive, truck, heavy duty off road equipment components where weight reduction is important. However, due to their higher strength and toughness, HSLA steels usually require 25 to 30% more power to form, as compared to carbon steels. Winzeler Stamping Company has developed an expertise in the utilization of HSLA steels and successfully provides a variety of components for our OEM and Tier I customers. Medium-carbon steels have higher carbon content, about 0.3% to 0.6%. These steels are easier to machine, and are relatively inexpensive. High-carbon steel contains carbon ranging from 0.6% to 1.0%. It will also typically contain higher proportions of manganese, which is added to increase the harden ability of the steel. High-carbon steels have greater tensile strength and are used to create products such as cutting tools, blades, and springs. Ultra-high carbon steels possess carbon in the range of 1.25% to 2.0%. It’s used to create components requiring extreme hardness. They are very sensitive to heat and possess superior wear resistance. The term spring steel refers to a group of medium to high carbon (0.5% to 1% carbon content), low alloy steel products which exhibit excellent yield strength, having the ability to endure significant bending or twisting and return to its original shape without deforming. Spring steel stock alloys typically include silicone in their composition and are hardened and cold rolled after casting to improve yield strength. When ingots and bars are rolled to rod or sheet, the process can be done hot or cold. Cold rolled steel is often specified for deep drawn and stamped parts due to its favorable surface quality, mechanical properties and formability. Cold rolled steel is steel that has been worked below its recrystallization temperature by passing it between a pair of rollers. Hot rolled steel is worked above its recrystallization temperature. Because it is softer, hot rolled steel forms easily, while cold rolled has superior drawing quality. Cold rolled steel’s tighter tolerances make it a better choice for highly engineered end uses. Secondary operations such as deburring, painting, and e-coating are very common with steel metal stamping components. Winzeler Stamping Company has metal stamping experience which includes simple to complex and small to large components. Our steel metal stamping capabilities include blanking, piercing, forming, and drawing of steel parts. 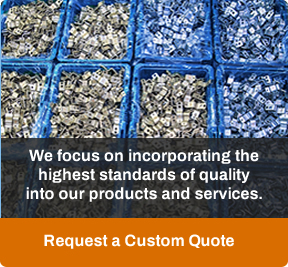 To discuss options for the component you need to source, phone us at 419-485-3741 or Contact Us by email.